When the American Civil War broke out there was a rush of enthusiastic volunteers to join the US Army as infantrymen, filled with outrage at the threat to the union or simply anticipating some adventure. Had these men known of the many hardships of campaign life, or the horrors of a modern battlefield, they might have been less eager to get involved. Yet in a war where the cavalry played a smaller part, and artillery, although technically advanced, could not gain or hold ground by itself, the infantry remained the most important element of the forces of the US. It was they who had to advance against objectives held by enemy infantry with good weapons, and they had to suffer sometimes enormous losses in doing so. Since the Confederate forces were often inferior in numbers, they were often on the defensive, forcing union infantry such as these to advance to the attack. As might be expected, this set is very similar to the first US Troops in Attack. As with that set, we are faced with a large number of advancing poses all pretty much the same, plus an array of speciality and unusual figures. In this second set all the advancing poses are holding their musket forward and with bayonet attached, so are perhaps rather closer to contact with the enemy than those in the first set. All have their right leg forward, which gives an overly regimented look to these men, who would not normally still be in step by this stage of an advance. That aside, the pose is fine. The main advancing pose is followed by no less than five casualty poses. The first two are in the process of being hit, while the third is already on the ground clutching his stomach. The fourth is a really unusual piece, for he seems to be plunging forward toward the ground, whether as a result of being hit or not we cannot say. The figure is achieved with a separate base, into which the man plugs very securely, and the result is a very lively and innovative pose which we liked. Finally we have a more conventional man lying on the ground. Clearly any advance that was contested would result in casualties, so these figures have their place, and are well done. The second falling figure still on his base is not so well animated, but is interesting in that he seems to have an entry wound on the upper right side of his chest. The remaining three figures are speciality men to accompany the charge, beginning with a drummer. He looks like he is supposed to be beating the drum, but as he holds both sticks vertically above the drum this would be impossible. Whatever the intention was, this is a thoroughly awkward pose and pretty poor. The man holding the flag is more conventional in terms of posture, and on the face of it there is not much wrong here. However his flag is quite small, such that it is barely more than half the height or width of an official infantry colour. Therefore it cannot be such a colour, but could perhaps serve for one of the varied state or unit flags sometimes carried. 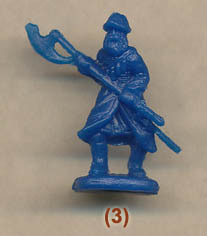 However we would have much preferred a proper-sized infantry colour here, which would also have had a spearhead finial on the staff rather than nothing at all, as here. Finally we have an officer apparently about to draw his sword, which is a good pose nicely done. The uniform on these men is exactly the same as the first set, so all are wearing the frock coat with standing collar. This was widely worn in the field, but was certainly not the only form of clothing, so we would have liked to have seen more of a mix of clothing, including sack coats. However the frock coat is not wrong, and nor is the fatigue cap everyone is wearing. The drummer does not have the braiding on the chest usually associated with such musicians, but this was not universal anyway so no problem there. The men have very little kit. All have a cartridge pouch supported by a belt over the left shoulder, a cap pouch on the belt over the right kidney, and a bayonet sheath on the left hip, which is fine. Some have a haversack more or less on the left hip, and some a canteen around the back, but few have both and some have neither. We felt this was too light an order, as virtually all the men would be expected to have all these items. No one here has a pack or any other items of kit, which is reasonable, apart from the pistol holsters carried by the officer, flag-bearer and drummer. Sculpting is fair, without the old Strelets chunky feel, but detail is sometimes missing and the whole finish is rather woolly and a bit vague. Fingers in particular are hard to detect, and the faces are pretty basic too, so while the proportions are good a closer examination reveals the limitations. In general the poses are not flat however, so quite nicely produced, while there is no flash anywhere, which is always pleasing to report. Despite a couple of reservations this set works well, and mixing it with the other ACW 'attack' sets from Strelets will produce a wide range of poses creating a realistic and animated scene of an infantry advance. Those who wish to will find it relatively easy to substitute full-sized flags for those on offer here, and the range of command and casualty figures should prove very useful for a more faithful representation of the many such actions during the Civil War.